In Hanoi the Third Party Congress of September 1960 ratified the previous year's decisions to intensify the struggle. 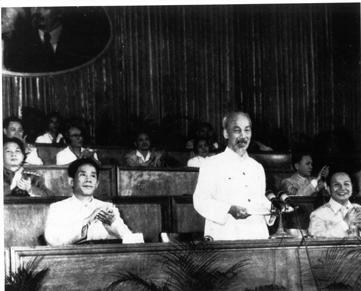 Le Duan, one of four southern Vietnamese in the new politburo, and former secretary of the central committee's southern directorate, is seated front row left next to Ho Chi Minh. Hanoi’s plan for the Tet Offensive consisted of three separate phases. In the first phase of the offensive, communist forces would draw American units into battles in remote areas of South Vietnam to lure them away from the heavily-populated areas of the country so that communist forces would not have to contend with them during the coming Tet Offensive. In executing this phase of the offensive, North Vietnamese forces initiated several large-scale and bloody engagements in the summer and fall of 1967, which came to be known as the Border Battles, in places such as Dak To and Con Thien. Also of particular importance was the January 1968 build-up of NVA forces around Khe Sanh, a remote US Marine base located in Quang Tri Province, (South Vietnam’s northernmost province) near the Laotian border. Once American forces were committed to these battles, the Viet Cong would initiate the second stage of the Tet Offensive, which consisted of positioning approximately 85,000 fighters to commence the assault on the urban areas of South Vietnam. In many cases, Viet Cong soldiers infiltrated the cities of South Vietnam by posing as holiday travelers from the countryside, coming to places like Saigon and Hue to visit family members. The third phase of the offensive was the assault itself. Though the communists struck more than one hundred towns and cities during the Tet Offensive, much of their focus was centered on the South Vietnamese capital of Saigon and the old imperial capital of Hue. Both of these cities had been largely spared up to this point in the war, but during the Tet Offensive, the communists brought the horrors of the Vietnam War to both of those cities, as well as dozens of others.